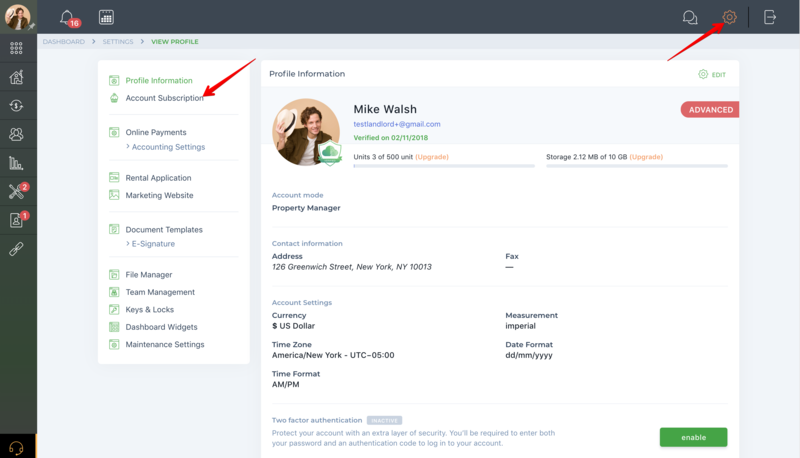 TenantCloud is a free, cloud-based property management software. You can sign up for a free Basic Account and use all the basic tools available in that plan, or you can upgrade your account for a flat monthly fee at any time to unlock a variety of useful features for your best business experience. To view the subscription plans and choose the most suitable, go to the "Account Subscription" page from the main "Settings" menu. 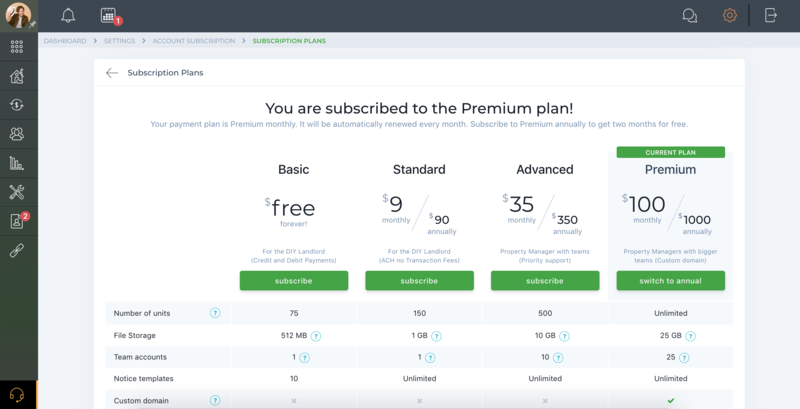 Here you can review your current subscription plan details, included features, limitations & usage, latest billing history, and primary card information. 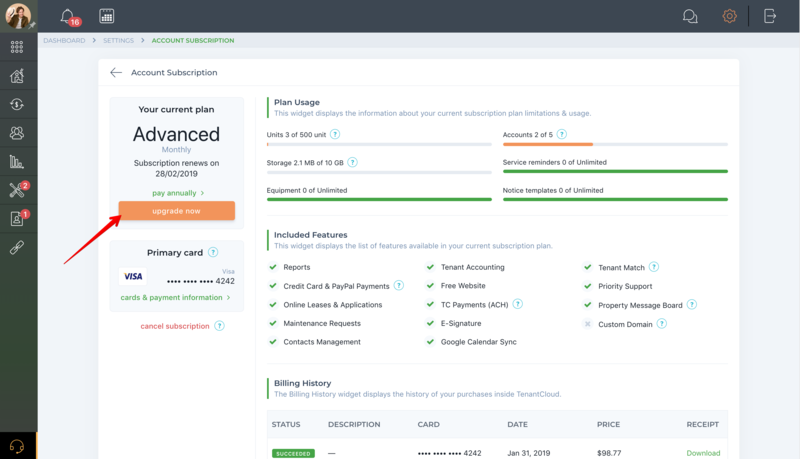 There are no trial periods, as TenantCloud offers a free Basic Account and three paid subscription plans. The plan you choose depends on your needs and which features will be the most useful to you. This plan is designed for DIY landlords with a small number of units. You can set up an online credit card and PayPal payments (tenants pay the fee). This plan includes everything you need to manage a small rental business. A professional website is also included. This plan is designed for landlords and property managers with a bigger portfolio and up to three team members. ACH payments (Dwolla) is included in this plan, and you can accept unlimited payments with no convenience fee. This plan also allows you to send the lease agreement for electronic signature. This plan is designed for property managers with a large number of owners. This plan includes all the features without limitations, property message boards, Google Calendar sync, and more tools for your rental business, as well as priority support. This plan is designed for property management companies. It includes all the features of TenantCloud and an option to add your own custom domain. You can select either a monthly or annually paid subscription. The annual subscription is available for any plan. When subscribing to the annual plan, you will get two months for free! You no longer need to worry about monthly charges or credit card updates. Talk about convenient and time-saving. Subscribe and enjoy landlording with TenantCloud!